Ready to get spooked, wined and dined for Halloween in Central Florida? Central Florida is Halloweentown, and it’s not only for kids. There is plenty of Halloween fun for grown-ups too. Best part is we don’t have to wait until October 31st. Whether you want to dress up in your favorite costume (don’t tell me you’re dressing up as a naughty Frozen princess! 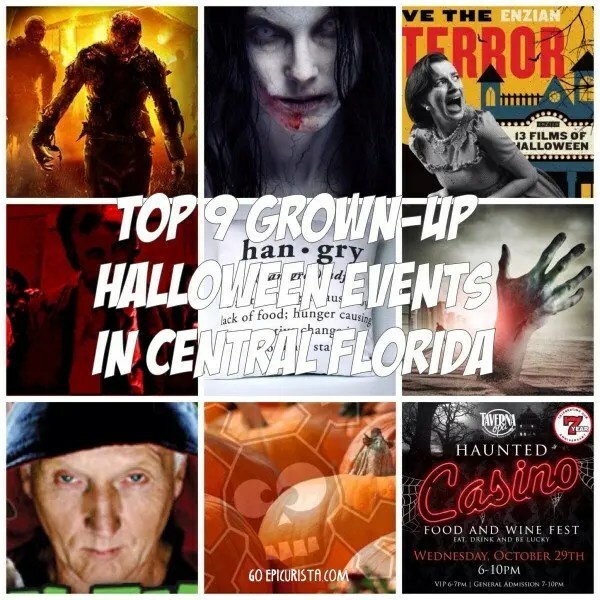 ), have the living daylights scared out of you, indulge in scary fine dining, run for your life, or just sit back and watch the horror unfold, here are my Top 9 GO Events for grown-ups to celebrate Halloween in Central Florida. 1. GO Mega Horror & Scream! Central Florida is home to the most horror-centric Halloween events in the world! An evening at Universal Studios Halloween Horror Nights in Orlando and Busch Garden’s Howl O’Scream in Tampa is a must for any horror-junkie. Warning: these events are not intended for kids (unless you want to pay for years of expensive therapy!) These Halloween masterminds go all out to make your worst nightmares come to life. 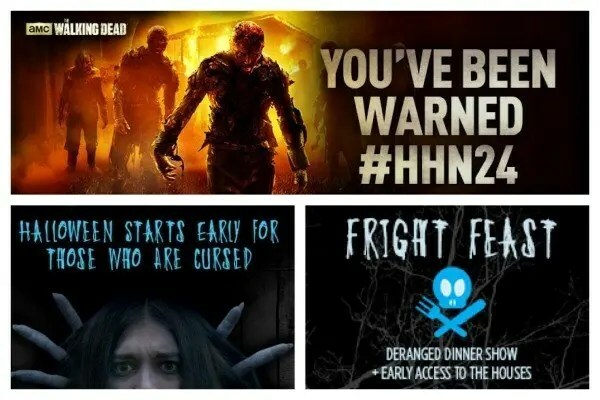 Make your way through terrifying haunted houses, scary street experiences and crazy live shows designed to scare the living daylights out of you. Events are held select nights and require separate admission. If, like me, you’re always wondering where to eat, check out my favorite eatery at Universal Studios, Finnegan’s Irish Pub for the Onion & Potato Web, Fish & Chips and plenty of beer on tap. Busch Garden’s Fright Feast includes full dinner buffet, exclusive “Fiends” show, 30 minutes access to the Haunted Houses before the crowds and VIP front of line access until 8:30pm. This may be your last meal, so enjoy it! If you want to be part of a Halloween movie, GO Mega Horror & Scream! 2. GO Cruising For Fear! 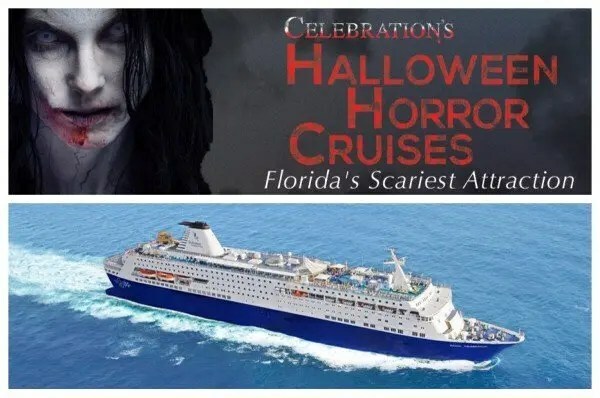 If you’re looking for a scary good party, head to the high seas for a two-night Bahamas cruise aboard Celebration’s Halloween Horror Cruises departing from the Port of Palm Beach. Enjoy various restaurants, live shows, casino, spa, pool and a full day in the Bahamas, plus Horror Events including a walk through the Deck of Death at the bottom of the ship! Choose from multiple sail dates throughout the month of October, starting at $116 per person. Call 800-957-7408 for reservations. GO Cruising For Fear! 3. GO to the Movies! If you prefer to sit back in a comfy chair and watch horror come to life on the big screen, Enzian, Maitland’s favorite independent theater, has a full line up of events and classic scary movies, including the 40th Anniversary restoration of The Texas Chainsaw Massacre and The Exorcist. During the film, enjoy a full menu and cocktails. Afterwards, chat all about it at Eden Bar, a beautiful outdoor venue and a bit spooky with hanging moss, perfect to celebrate Halloween in Central Florida. Check out the event schedule GO to the Movies! Did you know Central Florida is haunted? American Ghost Tours takes you on eerie adventures and paranormal investigations around Downtown Orlando, I-Drive, Orlando’s Greenwood Cemetery, Mount Dora, Daytona Beach and Winter Garden, where you will not only learn about the history of these haunted sites but also be able to use special tools to detect ghostly activity. For a more social experience, enjoy “spirits with spirits” on the Haunted Pub Tour of Orlando’s haunted bars, Friday October 10th (Circus Theme), Saturday October 18th (“Bring Out Your Dead” Theme) and Friday October 24th (The Roaring Twenties theme). On Saturday October 31st, a special Halloween Gangster Ghost Tour at Capone’s Dinner Show offers show, buffet dinner with drinks, plus a 2 hour ghost hunt in the building afterwards and costume contest. 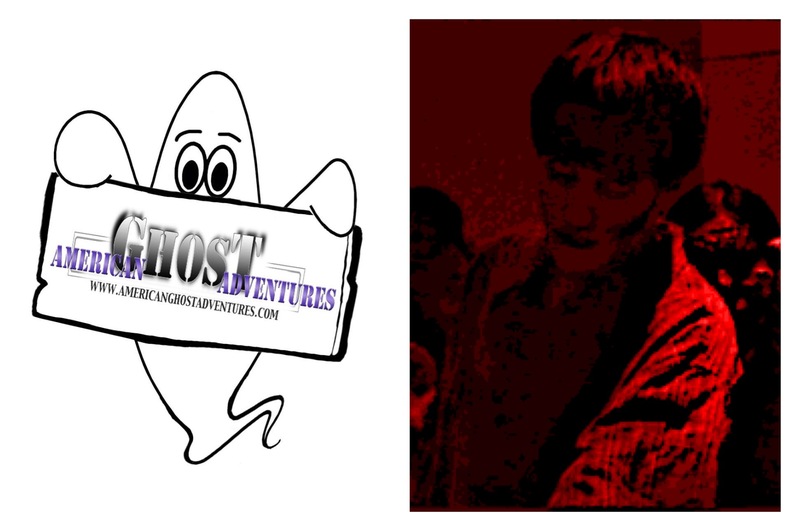 Make your reservation and GO Ghost Hunting! 5. GO Scary Good Fine Dining! 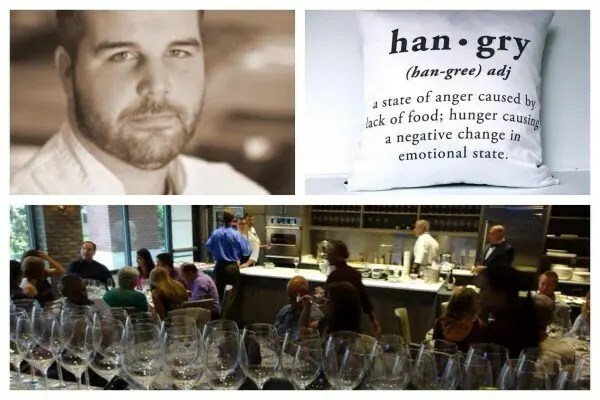 If you want fancy mixed with your scary and a culinary experience like no other, Epicurean Hotel in Tampa hosts “Halloween Gone Wrong” Supper Club on Thursday October 16th. Chef Chad flexes his culinary muscles with innovative and daring dishes, including Satan’s Shellfish and Dracula’s Degustation. For a true feast for the senses, dinner is prepared in front of you in the Epicurean theater. Space is limited. Don’t be squeamish and don’t get Hangry, make your reservation and GO Scary Good Fine Dining! 6. GO Run For Your Life! If you’re looking to be active in the name of Halloween, these fun 5K Runs and Walks should get your heart pumping again! ^ Walk (slowly) like a zombie on Saturday October 18th at the Official Fort Lauderdale Zombie Walk 2014. Party in the Quarantine Zone with DJs, Food trucks, makeup artists, crafters, and live artists before being unleashed on the streets, at the biggest gathering of the undead in South Florida. 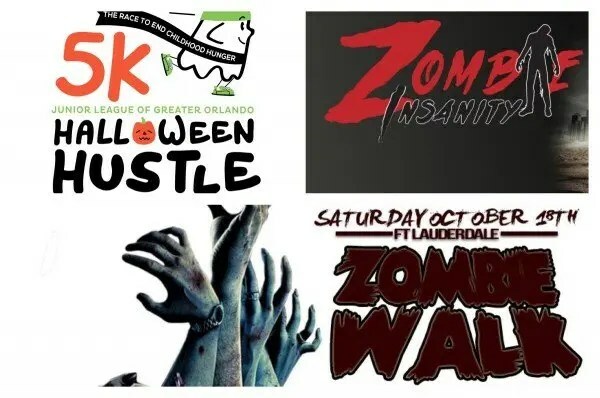 ^ Fun for the whole family, The Junior League of Greater Orlando hosts 7th Annual Halloween Hustle 5K on Thursday October 23rd, in Baldwin Park. Post-race, enjoy carnival-inspired activities, live entertainment and Orlando’s best food trucks. ^ Nothing will make you run faster than the undead! Zombie Insanity 5K Obstacle Course Mud Run on Saturday November 1st at Omega Ranch New Smyrna Beach, is an epic event for humans and zombies. Whether you make it out alive or undead, the post-party offers food, drinks, games, canoeing, tug of war and other activities for all day fun. Check out this Living Social deal and GO Run For Your Life! 7. GO To The Ultimate Horror Weekend! Spooky Empire brings the largest horror convention in the U.S. to Orlando on Friday October 24 – Sunday October 26, giving horror fans the opportunity to meet their favorite TV and horror film celebrities, mingle with other fans, buy collectibles, see classic and upcoming films, take part in the largest Zombie walk, get tattooed by artists from around the world, party to their heart’s content with live music and spooky events and celebrate Halloween in Central Florida. Register and GO To The Ultimate Horror Weekend! ^ If it’s beer you crave, Orlando’s Oblivion Taproom is known for an ever-changing craft beers selection. In honor of Halloween, they are hosting three events to frightfully please all beer lovers. Pumpkinfest 2014, Saturday October 25th, features a massive pumpkin beer takeover with over 18 brews on tap, pumpkin food specials and raffle prizes all night. Sunday October 26th, Danny Knight from Cast Iron Tattoos hosts A Night of Horror showing classic horror films, adult horror themed costume contest, free horror themed photo booth, original art from Cast Iron’s tattoo artists, raffle prizes and food specials. 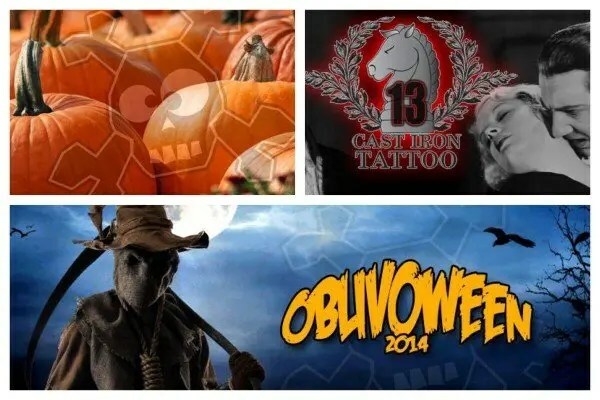 Friday October 31st, Oblivoween offers unique Halloween draft and bottled beers, a mega costume contest and plenty of food and drink specials for a Hoppy Halloween! 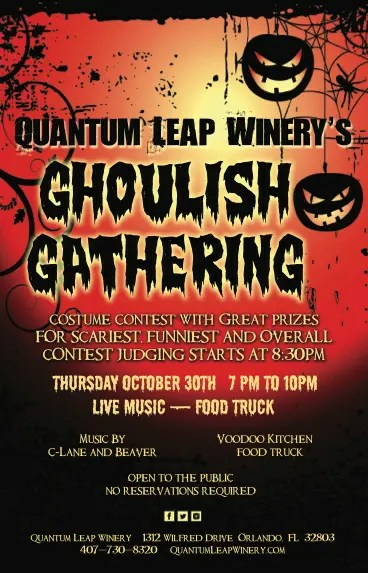 ^ If it’s fermented grapes your heart desires, Orlando’s only winery, Quantum Leap, hosts a Ghoulish Gathering, Thursday October 30th, with live music, food trucks and plenty of wine tasting. No reservation required. GO Get Fermented! 9. GO Eat, Drink & Be Lucky! Wednesday, October 29th, test your luck at Taverna Opa Orlando Lucky 7 Haunted Casino, benefiting Give Kids The World, a non-profit organization dedicated to fulfilling the wishes of children and families with life-threatening illnesses. 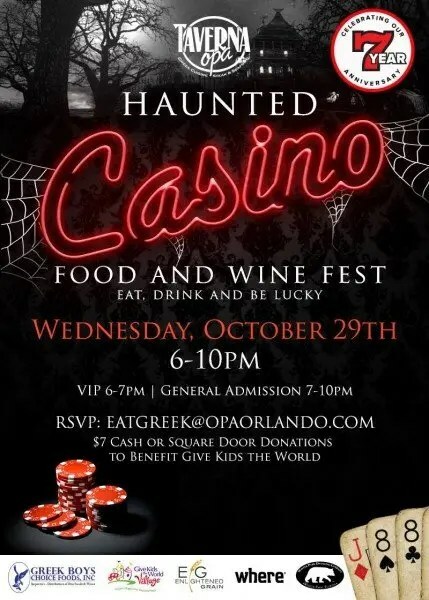 For one night only, owners Katerina and Vassilis Coumbaros, in conjunction with Where Orlando, will transform the restaurant into a spooked casino with live entertainment including magician show, pumpkin carver and contortionists. For suggested $7 door donation, receive tokens for casino games including black jack and poker. Enjoy Greek house specialties, spanakopitas, Chicken Kebabs and hummus paired with craft cocktails provided by Enlighten Grained Spirits and Winter Park Distilling Company. RSVP to [email protected] GO Eat, Drink & Be Lucky! I hope these events inspire you to get together with friends and celebrate Halloween in Central Florida. GO #MakeSomedayHappen! Celebrate life with great food, wine and friends this Halloween! 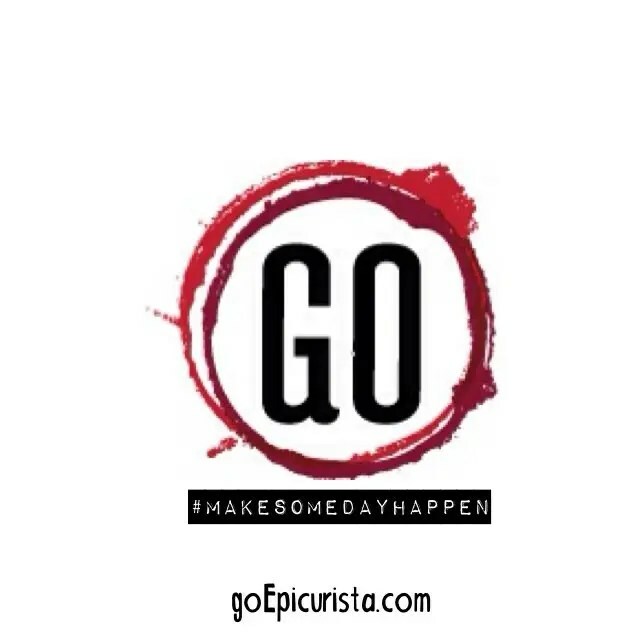 ^ If you have a fun event or restaurant promotion you would like considered for the Top 9 GO EVENTS List, please email your press release to christina @ goepicurista dot com. Please send in word or text format only and include available images. Thank you! ^ Photos used above, unless otherwise noted, are property of each respective event / organization listed. What a great listing of Halloween Haunts!! Thanks for sharing. The cruise looks like it would be a blast if you were to get a small group of friends to get in on it with you! Thanks for stopping by Cheryl! Yes, I think that cruise would be a blast with a group of friends. I hope you have a fun Halloween wherever you may be in the world! Cheers!